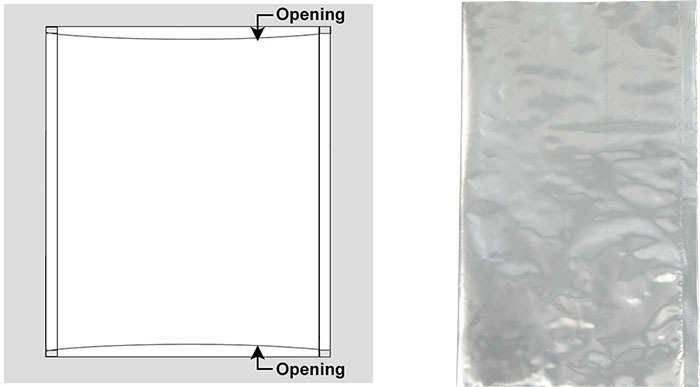 Ideal to separate contents within a bag through the use of a vertical heat seal. Provides a flat surface to seat bulky items. May promote better stacking within a shipping container. Capability to produce bottom gusset only. Available on any bag structure and type for any application that requires the product to be displayed to improve visibility. Round hang hole and sombrero shapes are "standard", but custom shapes are available. 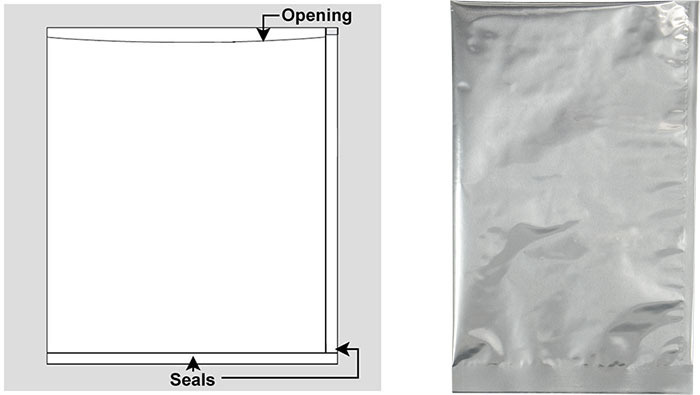 SCS can place any number of hang holes that are required to most bag structures. Allows open top bags, longer than 36", to be manufactured on the SCS bag machines instead of the bag having to be hand-made - making them more economical with shortened lead-times. Generally made with no markings. Available in most bag structures. Custom Hot Stamping - Custom hot stamping and printing is available. A maximum of two hot stamps in two different ink colors can be applied to the bag. The print on the bag can be no larger than 3.5” x 3.5” for each hot stamp. Ink colors available are yellow, black and blue. Custom Labeling - A pre-printed label can also be applied to bags. SCS has a label inspection system to make sure the label is present, straight and not wrinkled. Ideal for a more permanent seal. Ideal for automatic bag-sealing machines. 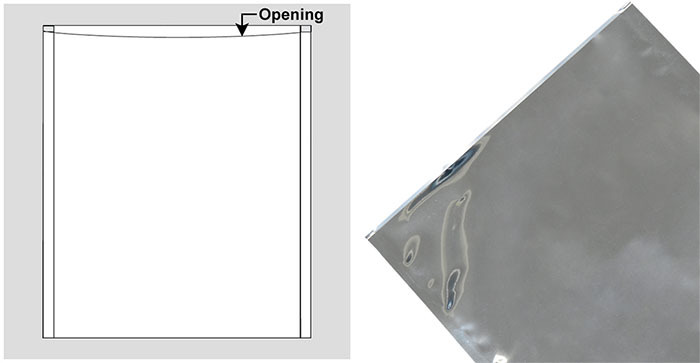 Can be folded or secured with ESD tape or ESD label. Also known as our "rip top" bag. The bag is created with a soft fold at the top of the bag, with tear notches and a zipper. The bottom of the bag is open. The zipper allows the customer to use the bag again. Product is loaded into the bag from the bottom and then heat sealed. 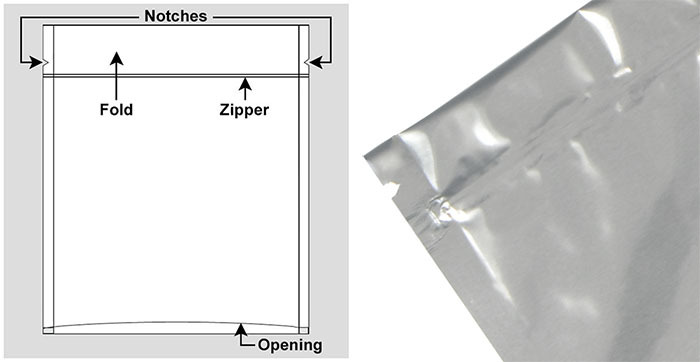 To access the product, the customer rips the top off the bag above the zipper. Rip top barrier bags can be vacuum sealed. The maximum length of rip top bags is 15 inches from the opening to the zipper. 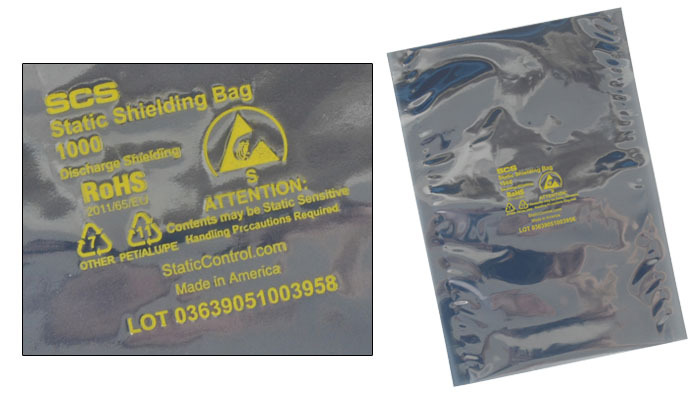 Available in all bag structures, except Dri-Shield® 3000 and Dri-Shield® 2700. 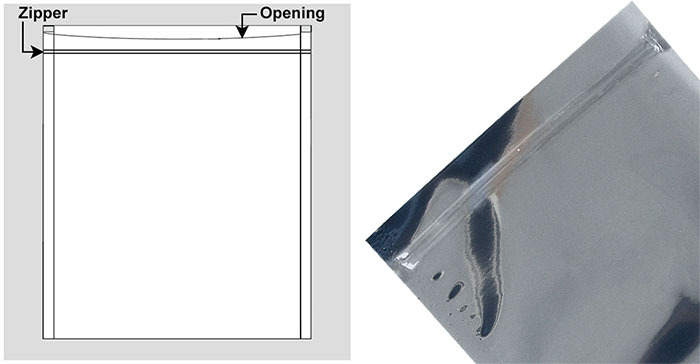 Once heat sealed, the bag ensures security of contents until opened by using convenient tear notches. 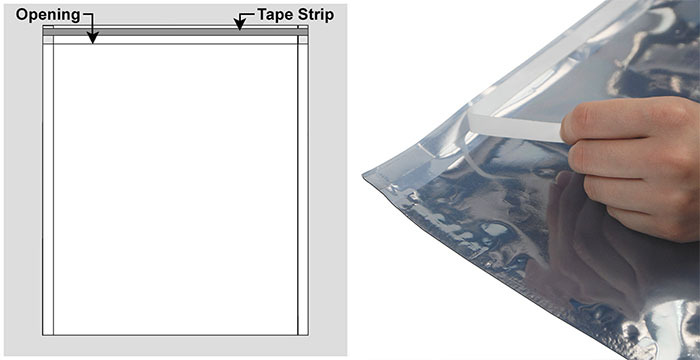 SCS's tape top bags offer a self-sealing tape closure that is reusable for multiple uses. They are easy to open and do not require a heat sealer to close. To close the bag, simply peel and remove the paper backing and fold the flap closed. Open the bag by lifting the flap. 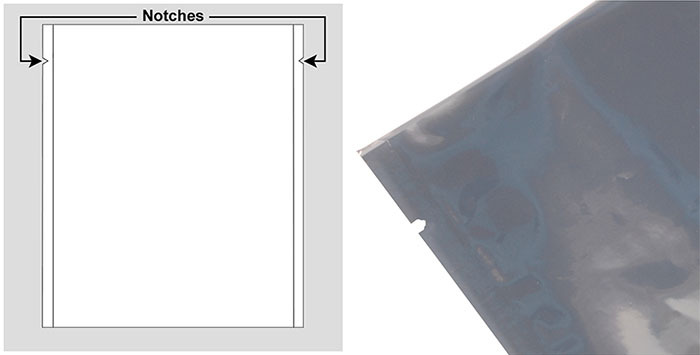 Cut to length special size bags for odd shaped or extra-large products. We can wind a roll to the max width of a 20" opening. Eliminates the need to stock an expensive variety of bags. Can be opened and closed repeatedly to simplify access. Wide range of sizes from 2" - 39" wide x 2" - 35" long. Static shield protection when the zippers are closed. Available in all bag structures, except. Dri-Shield® 3000 and Dri-Shield® 2700. 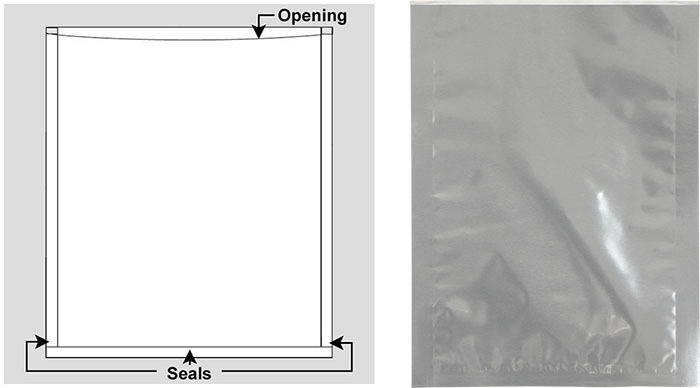 For automatic bag-sealing machines and applications that specify this additional seal in lieu of the standard SCS soft-folded bag bottom. Available in all bag structures. For additional information, please complete the below packaging capabilites request form. We want to email you exclusive offers and the latest information from SCS and associated partners. We’ll always treat your personal details with the utmost care and will never sell them to other companies for marketing purposes. You can unsubscribe at any time.